For many Harley-Davidson riders, customizing and upgrading their bikes to their own unique tastes is part of the spirit of the brand. This 1980 Harley-Davidson FXWG-80 Wide Glide has been rediscovered from the depths of a large, private collection and is the epitome of an era that was all about customization. As much of a "Barn Find" as any, this Wide Glide was built with the intentions of being all things Cool. One glance and you'll find billet foot controls, a custom fascia, stainless steel lines, and so much more. The laid-back handlebars are adorned with S&S billet hand controls, while a Drag Specialties speedometer shows this Wide Glide has traveled 3,793 miles. While chrome has always been a staple for the modern look, this Harley is all about the poised and sinister stance that only rich black paint can offer. Unlike so many Harley-Davidson's of the era, the numbers match on the engine case and frame. Hiding under the S&S air cleaner and backing plate, the 80 cu. in. powerhouse breathes through an S&S Super E carburetor, while exhaling through a single outlet exhaust. Upgraded billet brake calipers are found on both front and rear, utilizing stainless lines. The rear suspension has been upgraded as well, offering chromed Progressive Suspension coilovers. Before the advent of check engine lights, mechanical gauges were the means in which engine vitals were monitored, a duty upheld by both the oil pressure and temperature gauges that are fitted. 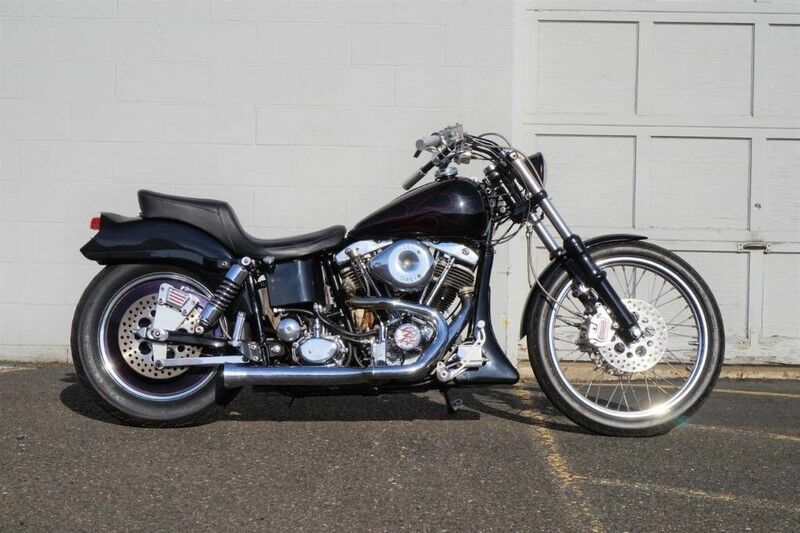 This Wide Glide is truly buried treasure that is a time capsule into an exciting era of customization. With patina being a word so commonly used, this Wide Glide has aged handsomely, showing nicks and wear that give it wonderful character. This is not a show bike nor an all-original-survivor - it is a Harley-Davidson built by the passion and spirit of a true Harley-Davidson rider, for whom this Wide Glide awaits to head back out onto the open roads.